“A new microscopy technique developed at RMIT allows researchers to see more of what’s happening inside cells. The new “bleaching-assisted multichannel microscopy” (BAMM) technique improves the quantity of information captured in fluorescence microscopy. This will allow researchers to better observe protein and molecule interactions in a wide range of health-related research. The technique was developed by a team led by RMIT University’s Dr Antony Orth, a Research Fellow with the Australian Research Council’s Centre of Excellence for Nanoscale BioPhotonics (CNBP). 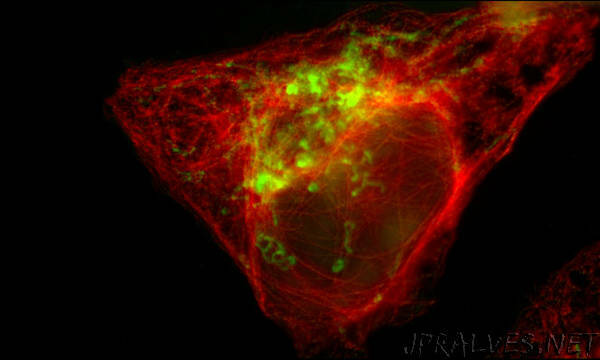 Fluorescence microscopy, where light-emitting “fluorophore” molecules are used to label proteins or other cellular targets, is one of the most widely used techniques in biology. “When a fluorophore is excited by light, it reacts by emitting a specific colour signature,” Orth says. But Orth’s innovation overcomes a major limitation of this standard technique, where there’s only enough space in the visible spectrum for about four distinct colours before they start blending together. This limits the number of cellular targets that can be viewed in a given sample. “Instead of using colour to differentiate between fluorophores, we use the fourth dimension of time and exploit a phenomenon called photobleaching – the dimming of a collection of fluorophores or pigments under repeated exposure to light,” Orth says. When paired with traditional colour information, this added dimension of photo-bleaching enables scientists to use two to three times more types of fluorescent molecules, all in one sample. This allows researchers to extract far more information from a single investigation. An Australian Research Council Centre of Excellence, the CNBP is a $40m initiative focused on developing new light-based imaging and sensing tools that can measure the inner workings of cells in the living body. Researchers involved with the BAMM project were affiliated with the CNBP and global life sciences company Thermo Fisher Scientific.